Dog Meets Bunny: Rose Finds Her Voice and It’s a Growl! Plus 5 New Pics! Rose Finds Her Voice and It’s a Growl! Plus 5 New Pics! 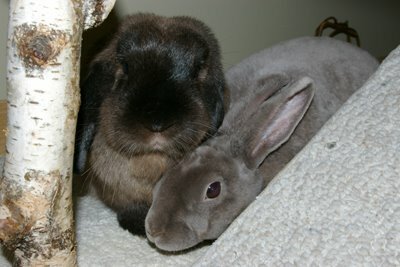 In my last update I reported that I was using a bunny bonding technique sometimes called “dating” to introduce Rose and the bunnies. Shortly after writing that update I discontinued the “dating”. The bunnies were spending the whole dating session obsessively biting the bars of the enclosure trying to return to their house. Rose would sit patiently on her bed and practically fall asleep. There was no interaction between the three, and none of the benign neglect that you might see in a regular bunny bonding session: grooming, flopping over, nose-to-nose greetings, etc. It didn’t feel like the sessions were productive, so I had to rethink my approach. Since then, I have just focused on letting the rabbits out of their house whenever they wanted and supervising as they came out to explore. Rose would generally be snoozing somewhere, and I discovered that when Mouse would hop up to sniff her she would sometimes utter a low growl under her breath at him. She wouldn’t sit up or assume any aggressive body language. She didn’t show any teeth. This was more of a very quiet warning growl. Unfortunately, Rose doesn’t understand that Mouse doesn’t speak her language, and her ‘growling as warning’ has no effect on him whatsoever. He would continue to invade her personal space and get right up in her snout. This worried me quite a lot. At first I would give her a very stern and forceful “NO” command. Saying no always gets her attention and she acts very submissive when it happens. But saying no seemed to have no lasting effect: she would growl again in the same situation a day or two later. I really believe that the negative reinforcement of “NO” is much less effective than the positive reinforcement of saying “good dog, gentle dog”. So I started really watching what was happening when Mouse would hop up to Rose. Before she had an opportunity to growl I was already praising her, saying “good dog! Gentle girl!” After a week or so of this positive reinforcement we haven’t heard any growling at all. We have now gotten to the point where the bunnies can be out of their house whenever there is someone home to casually supervise what’s going on. If I am taking a shower I put them in their house. If I am in the kitchen making dinner, I let them out. Mouse has gotten so bold with Rose that he has used her body as a launching pad for jumps several times. 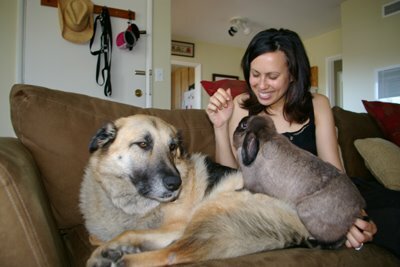 And Rose has gotten so good with the rabbits that she only looks perplexed when this happens. Thankfully Rose hasn’t shown any signs of food aggression, and just looks on when the rabbits get a treat on my lap. Of course, this led her to believe that eating a prune might be of interest to her too, but after several minutes of rolling it around in her mouth she decided maybe not. 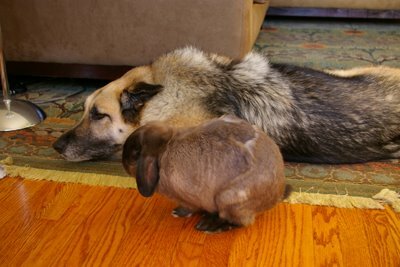 There is a tendency for a dog like Rose to want to police or supervise what the rabbits are doing. I have made it clear to her that this is not her job, but mine. When Mouse is creating a ruckus in another room and Rose hears it, she is likely to go trotting off after him to police his behavior. I will intercept her and remind her to mind her own business, that it’s my job to patrol the rabbits. I also never speak in a threatening or angry way with the bunnies. It’s important to never give the dog reason to think she should step in to protect me or to support me in opposition to the rabbits. The most important things that we are doing right now are keeping up with the praise and positive reinforcement of Rose’s good behavior. 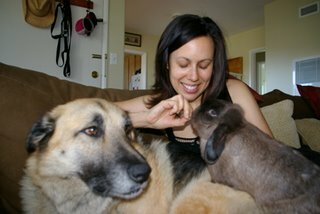 I keep reinforcing her role in the pack as “below” that of the bunnies. I feed the bunnies before I feed Rose. I let Mouse climb on her and praise her for being gentle. I also make a point of talking to Mouse and Duchess in front of Rose, telling them that they are good bunnies, I love you, etc. This way she can learn that they are valued members of the pack. She is a really smart dog and it hasn’t taken much to drive these points home to her. We are hoping that as things become even more comfortable and stable that we will see more friendly interactions between the three. just wanted to thank you for the reassuring story. i won't be adding a dog to my home for a year or two yet but it's nice to know that others have had success with it. best of luck with the rest of the bonding! i've never written on a blog like this before, but i wanted you to know i'm going to keep this page bookmarked. we just adopted a little PowderPap (Chinese-crested Papillon.. he really is very cute.. and does have hair!) 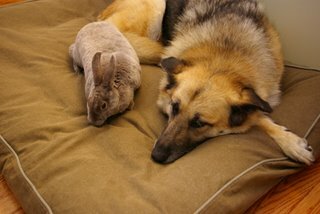 this past Saturday and i'm experimenting with ways to get him used to our house rabbit, Daisy. So far, i've kept her in the downstairs bath with a gate up while Barney (the dog) is running loose.. so they can get used to each other's scents. it's worked pretty good.. i can tell already there's more calmness from the rabbit.. and the dog.. she also gets to run during the day while we're gone and Barney's in his kennel upstairs.. that way, she's not "kicked out" of her house either.. cause she had full run 24/7 before he showed up! so, i'll try some more introductions outside of the bathroom in a few days.. just want things to get settled first..
well, anyway, thank you for the web site. it's very helpful and nice to see this can be done!